Recently my attention was caught by Radio NZ briefly publishing an idea about a “Pouakai Crossing” track in Egmont National Park , supposedly to “rival the Tongariro Crossing” according to the headline. On seeing that headline, my first thoughts were admittedly “why” and “how”? Mount Taranaki, spectacularly reflected in the famous Pouakai Tarn nearby this fabulous proposed new route. It’s Taranaki, so it’s usually raining. I don’t mind this, myself. I think that getting out and tramping in the rain helps me to appreciate an environment in ways which many people often don’t see it. Unless it’s Taranaki, in which case getting out and tramping in the sunshine helps me to appreciate an environment in ways which many people often don’t see it. To be fair, I have once completed a slightly modified Pouakai Circuit walk, during which I recorded not a drop of rain at all. I wrote it up to preserve the memento . There was little in Radio NZ’s actual article consistent with the headline’s claim of “rivaling the Tongariro Crossing”, so maybe it was artistic journalism in that case. Looking further, the Taranaki Daily News had also printed this more detailed article  a week earlier. The more I think about it, it doesn’t seem as crazy an idea to me. It sounds as if it’s mostly a marketing push, to promote the managed track which is already there and improve facilities at the ends, thereby providing something which appeals to tourists. This could result in it being at least as much of a local council thing as a DOC thing, because many of the initial adjustments mightn’t be on DOC-administered land. You can already easily walk one proposed variant of the route on existing managed tracks in the park right now. In fact, one of the main advocates, the Kiwi Outdoors Centre, already promotes a self-guided trip for which they’ll provide a transport service at each end . The Park’s Management Plan is due to be up for revision soon, so the idea will probably get some consideration as part of that process. 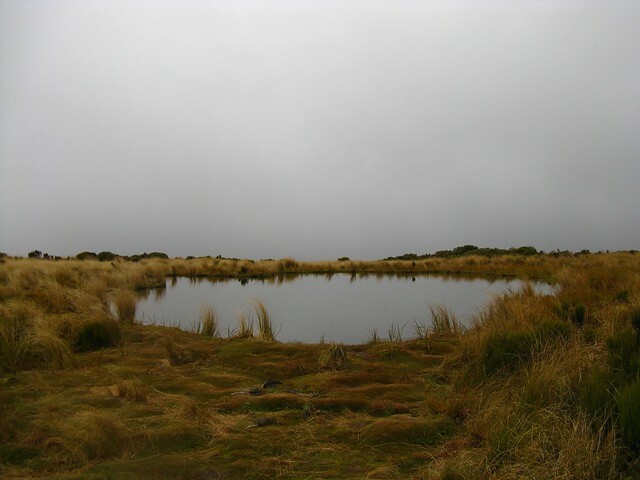 The route being described is the most obvious interesting route for a crossing of the Pouakai Range at present. It starts at the North Egmont visitor centre, up the Razorback, around past Holly Hut, across the Ahukawakawa Swamp to Pouakai Hut, and then down a relatively steep track to the end of Mangorei Road. From a tourist perspective it makes most sense to walk it in this direction, if only to avoid a steep grind of a walk up the hill from Mangorei Road to Pouakai Hut. The idea is that it can be done in a day, which is probably where the comparison with the Tongariro Crossing has been derived. The problem? Mangorei Road is basically a dead-end farm road. For the insanely fit locals in various Harrier Clubs of Taranaki, it’s feasible to park a car there, run up and around the side of the mountain (in the rain), swapping keys in the middle with a friend who’s running the opposite direction (in the rain), all between morning and afternoon milking sessions (which will also occur in the rain). But Mangorei Road’s current state is less enticing for someone on a one-way trip if it entails waiting for transport out of there, or needing to arrange transport once you arrive. Especially when it’s raining. An alternative to improving facilities at Mangorei Road, also being proposed, could be to re-cut a route, reportedly already there to some degree though someone else would need to indicate its state. The new route would go from Pouakai Peak (.1400), presumably north to Kiri Peak (.1342), then down to the Pukeiti Rhododendrum Gardens. This would mean that instead of trotting down to Mangorei Road via Pouakai Hut, people could instead go 40 minutes further west, to Pouakai, before dropping down to a place which already has a cafe and that’s more than willing to exchange visitors’ money for a various range of goods and services. The whole thing is an interesting idea. I’ve been trying to think of what sorts of outcomes might result, either positive or negative. The media articles have noted concerns from some that Egmont National Park could become an overused tourist magnet, comparable with the Tongariro Crossing which might, on a few popular days, have an insanely high 1000 people walking it. Not everyone wants to see that happen to their local back yard. Fair enough, too. I don’t personally think it’s likely to change much, though. This is in part because the nature of the weather in the area means that the Pouakai Circuit often doesn’t result in a fantastic vision of the mountain, even when you’re half way up and virtually underneath it. It’s entirely possible to walk this route and see little more than trees, wetlands and boardwalks and the wildlife which comes with those three things. Not that there’s not plenty of cool stuff to see in trees and wetlands and boardwalks, but those anticipating a spectacular alpine vista might often leave disappointed. Another point to make regarding comparisons with the Tongariro Crossing is that Mount Taranaki already shares several attributes with the types of tourists. The relative accessibility of climbing Mount Taranaki compared with other mountains means that, for certain days, the mountain can be flooded with relatively inexperienced people climbing to the summit, carrying minimal protective gear and unprepared for what might occur if something unexpected happens. In the same way as it could some day happen on the Tongariro Crossing, Mount Taranaki could experience a sudden change in weather which catches a 50+ unprepared people in an extremely dangerous place. On this, one thought which occurs is that having a targeted and marketed daywalk option in the park might also give a more obvious alternative to visitors who’d otherwise simply aim to climb the mountain when they have a day to kill. Neither option is completely wihout risk, but in adverse weather a Pouakai Crossing route is substantially lower risk for non-alpinists than aiming for the summit. Maybe an alternative outcome, however, is that a much higher than current number of people could venture into the Pouakai Crossing route without adequate preparation. Thi might especially be the case with it being marketed as a daywalk. People preparing for daywalks often choose to carry substantially less, even if the risks are the same. On the possibility of cutting a new track: I enjoy opportunities to explore off-track, and generally speaking I’m not the greatest fan of cutting new tracks everywhere. Sometimes the most fun way to explore a route is one where you need to figure it out yourself. Also, wherever possible I prefer the concept of going with, and sometimes enhancing, the tracks which form more naturally through people and/or animals frequenting the routes between points which are useful to travel between. Sometimes newly cut tracks are clearly beneficial, though. They can create easier access to places that were previously infesible to reach, or dramatically speed up access to more interesting places. It has to be said that a large part of tramping’s own history has been built around tracks that were originally surveyed and cut or tourism purposes. I’m also curious about possible effects which a new major access point could have on skewing which parts of the park are used and how they’re used, and not just from a newly-championed Pouakai Crossing route. For example, the road journey between Mangorei Road and anywhere on the west of the park is relatively lengthy, but it’s more direct heading south down the western side from the Gardens. If a Pukeiti Gardens were to provide reliable security for parked vehicles then maybe it makes the entire western coastal flank of the mountain more accessible for people who only have time for shorter trips without walking an entire round-the-mountain circuit. This could result in higher use of Kahui Hut and Waiaua Gorge Hut, from people who choose to go that way from a major access point instead of towards North Egmont. These are just some random thoughts. Egmont National Park will remain a great (and rainy) place to visit, with or without the heightened facilitation of a Pouakai Crossing route. 4 Comments To "Thoughts about a Pouakai Crossing route"
Hi @wayne. I’d heard 1000 on popular days, but 2000 wouldn’t surprise me. Update: There’s been more on the proposed Pouakai Crossing work on Radio NZ this morning. , and .